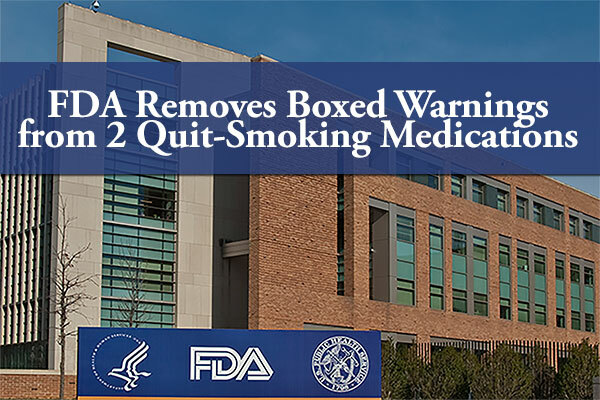 The FDA has removed the boxed warning regarding serious neuropsychiatric events from two stop-smoking medicines, varenicline (Chantix) and bupropion (Zyban). Based on a review of a large clinical trial, FDA has determined the risk of serious side effects on mood, behavior, or thinking is lower than previously suspected. The risk of these mental health side effects is still present, especially in those currently being treated for mental illnesses such as depression, anxiety disorders, or schizophrenia, or who have been treated for mental illnesses in the past. However, most people who had these side effects did not have serious consequences such as hospitalization. The results of the trial confirm that the benefits of stopping smoking outweigh the risks of these medicines. FDA has updated the existing warning section in both labels that describes the side effects on mood, behavior, or thinking to include the results from the clinical trial. This decision is consistent with the recommendations of external experts at a September 2016 FDA Advisory Committee meeting. The patient Medication Guide that explains the risks associated with the use of the medicines will continue to be provided with every patient prescription; however, the risk evaluation and mitigation strategy (REMS) that formally required the Medication Guide will be removed. Our review of the clinical trial results also confirmed that Varenicline, Bupropion, and nicotine replacement patches were all more effective for helping people quit smoking than was an inactive treatment called a placebo. These medicines were found to better help people quit smoking regardless of whether or not they had a history of mental illness. The health benefits of quitting smoking are substantial, including decreasing the chances of developing lung disease, heart disease, and some cancers. There are also benefits that are nearly immediate or occur after a short time as a nonsmoker such as improvements in circulation, breathing, and the senses of taste and smell. Millions of Americans have serious health problems caused by smoking that can be reduced by quitting. Smoking has been found to harm many organs in the body and diminishes a person’s overall health. Varenicline and bupropion are prescription medicines that are FDA-approved to help adults quit smoking. For more on varenicline, click here.